The Biological Complexity of Single Cell Life and Structure is Evidence of the Intelligent Design in God's Creation - Genesis Alive! The MO-1 7 motor, 24 gear marvel! This Bacteria signals the End of Reason for Evolutionary thinking as not only is it powered with 7 proton motors, its a swimming laboratory as well! The "Simple" Prokaryote single Cell with over 4 million DNA code bits. In the story of life's origin, naturalists tell us various chemicals collected in ponds and self-assembled into amino acids. (The building blocks of proteins or cell material). In time these acids further self-assembled into proteins, then cells - they say. Now think about this, the leap from an element to protein, then protein to cell is quite a task in itself. This is no different than saying we have aluminum, copper and steel etc., and sprang forth a 747! That’s a small statement about a very big thing when speaking of life coming from chemistry! Evolutionists assert the Prokaryote cell on the right did so. Fact is, this creature has the same number of working parts as the jetliner! One of the proponents of this theory was Dr. Dean Kenyon, outlined in his popular book, Biochemical Predestination. In It, Dr. Kenyon asserted that the valences of chemical compounds could have self-attracted into organized structures ending in a cell. This concept seemed to have saved the idea of mindless self-assembly as required by evolution, but was later disproved. Note that Kenyon abandoned his theory and later became a strong promoter of Intelligent Design. He determined that if evolution was true it required DNA evolving in parallel synchronization with cell operation, an impossibility without intelligence. Below this excellent video demonstrates the complexity of cell formation and includes live comments by Dr. Kenyon. Miller did get an Amino, a poisonous one! From Poisons to functioning life? In 1952 Miller attempted to duplicate the process of soup to life origins, they were successful in the assembly of acids, more accurately - lethal poisons! “It has become apparent that organizing simple molecules into assemblies capable of reproducing and evolving is a far greater task than was generally realized during the excitement that followed the experiment”. (1) Note the experimenters used compounds already known in cells to get an acid, but were stopped cold as far as any life making goes. Now as these stories are told and retold with artist conceptions in textbook pages, these “probable” explanations eventually become beliefs in the absence of other explanations. Such experiments have long been suspended as failures. Of late, many theorists have simply moved the problem a step back, suggesting life came to earth from outer space in an attempt to divorce the problem from evolution entirely. New words have been coined such as "abiogenesis"or "probionic" etc., referenced only to maybe's, could-haves and probabilities in papers containing no scientific basis for explaining life's origin. DNA, the most efficient data storage system in the world! The DNA sequence strand, with it's coding equivalent of over 2 GigaBit of data in humans! When more powerful microscopes became available in the 1960's, an amazing finding was made; the discovery of the DNA coding strand by Dr. Francis Crick. (1) This strand of highly organized chemical units contained the coded technical instructions to build life on a chemical tape, directing the operation and work of the cell. This finding revolutionized man's understanding of life's complexity. The DNA triple base "life code" uses the same language in all living things, from amoeba to man, and is seen to be exactly the same since life first formed. This stasis of the code and mechanism is a challenge to the concept of evolution, a theory that tout's the ability to change life forms quite prolifically! One should consider the contradiction of absolute stasis in cell operation compared the suggested amazing power of evolution, which claims that from a single cell all life forms on Earth were derived. Does DNA (2) point to a common Super-Intelligence or better support the accidental probability of evolution? Evolutions operation depends completely on mutations, or random mistakes entering the genes, causing change. After these changes occur either good or bad, natural selection isolates the good traits and the life form moves forward. If this is true the DNA and cell mechanism should have changed along with it, it has not. This means that the codes for all the different life forms on earth were introduced at some critical point in the past. Biologists often refer to this as the Cambrian explosion. If we open the Bible it would be defined as Creation. The worst diseases doctors treat today are caused by genetic mutations. Nearly 4,000 diseases are caused by mutations in DNA. (4) So in truth, mutations are a poor way to create new forms of life. Better done by Intelligence! Many operations in the cell are well explained using analogies of computer operation. For instance, the DNA code size for people would be over two Gigabit! A cell has a copy machine, data reading heads, an archive, energy sources and conversion systems, replication capability and assembly factories all smaller than visible. Dr. Crick, the co-discoverer of DNA, seeing this complexity postulated that the code and operation must have come from some external source, and not from Earth; "An alternative to Earthly abiogenesis is the hypothesis that primitive life may have originally formed extraterrestrially (either in space, on Mars or elsewhere)". (4) In other words, Dr. Crick couldn't imagine this micro-complexity occurring by accidental and naturalistic means, so he reckoned it must have come from a Super Intelligence outside our Planet! In truth, Dr. Crick was hinting at God! 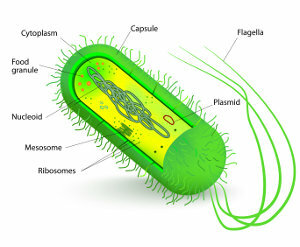 Prokaryote bacteria - the first known cell, or one of many created together? A Prokaryote (1) bacteria is considered the first single-cell animal, claimed to have been found among the oldest known rocks on Earth. However, when closely studied with electron computer imaging we find this tiny creature amazingly complex, made with many millions of molecules operating in perfect order, like the 747! "The genetic material (DNA) in most bacteria contains some 4.7 million base pairs. Stretched out, this molecule would be about 1,000 times longer than the bacterium itself". (2) The DNA is just the software, what about all the other systems that work, read, duplicate (The DNA of bacteria alone replicate error-free at an amazing rate 30,000 "letters" per minute) and assemble in the cell! In other words these tiny animals are far from "simple". They maybe said to be less complicated as their companions the Eukaryotes (mentioned later), which are far more complex in comparison. As we can see, dead chemicals becoming life are a big deal, and explaining this gap away with a few drawings and words is entirely over-simplistic. (2,3) We also must consider cell only have DNA reading capacity, not information writing capacity like your computer has. In Charles Darwins day, the general understanding of biologic change was that characteristics could be inherited--that is, if an animal acquired a physical characteristic during its lifetime, it could pass those characteristic on to its progeny. This of course was proved false years later. A Prokaryote single cell has a motor? Yes, one powered by protons with a free spinning center shaft! To the left is an Electron Microscope side view image of the Prokaryote proton powered axial motor. Notice the rotor shaft oriented in vertical center in the left hand image. This is the spinning part that protrudes out the top of the motor that connects to the propelling tall that provides water propulsion. These so called "simple" life forms incorporate this amazingly complex device to propel them, the Axial Flagellum Proton-Powered Motor. (1) This unit has a spinning axial shaft to propel itself like a motor powered boat! Millions of dollars are being spent to understand the operation of this engine, and many questions remain about its actual operation and what controls it. Interesting thing is, a Prokaryote is thought to be a primordial cell, or first one out of the primordial "soup" in evolutionary terms. Now that technology exists to study them, the issue of complexity has become inexplicable in evolutionary terms. Researches are often at a loss for words to describe this micro-machine. Again, evolutionists are faced with describing the evolutionary origin of the motor and how it came about to be powered by protons. A few examples are quoted for further study below. Diagram of the Axial Flagellum motor found in many bacteria. This amazing machine is found in many Prokaryote bacteria (like e.coli for instance) and are described with labels such as 'rotor' and 'stator', identical to modern AC electric motors. The propelling tail or flagella has been found to be almost 100% efficient and a complex wonder in it's own right. The motor is powered using hydrogen ions (protons) and in some cases sodium. (1) Charges act on fixed 'coils' arranged in clock locations around the free spinning rotor shaft. The shaft is connected to its propeller or ‘flagella’. No one knows exactly how these motors work or even start turning, but we know that ion motive energy is metered at the proper time to control speed and direction of the 'rotor' shaft by acting on these 'coils'. AC electric motors require a "start circuit' to begin rotation, and may not change direction of rotation on the fly or stop like this motor can. (2) A complicated controller is used meter out small handfuls of ions in step measure. One paper (3) claims to have measured the normal proton feed per coil at 37, +/- 2! The e. coli has 11 coils and turn at several hundreds of RPM. Some species turn @100,000 rpm, so a motor equipped with 10 coils would equal 1,000,000 proton pulses per minute! These motors also have a torque sensor and feedback loop to instruct the creature to run at differing speeds and direction like forward and backward, not bad for a 'simple' single cell! In fact, the Prokaryotes mentioned actually live inside you now, they are classed as e. coli! 1. Science has not yet unraveled the mystery of this tiny isolated part of this "simple" creature, so how can one attribute such complexity to mindless, self-producing evolution? Where are examples of such change processes going on today? If the development was mindless and accidental, we with minds should be able to unravel this "marvel", or better yet, construct one of our own, but we can't. 2. This said, an age-range is suggested for this complex motor, "honed to perfection" by "Billions of years of evolution. ", but no example's are provided nor cited. No examples exist in science where time has made anything operable with 3 or more interacting parts. So how is time the creator?, we know the motor has over 20 parts made of thousands and thousands of perfectly arranged proteins as instructed by the DNA. What? They found a proton powered cell with 7 motors and 24 gears! 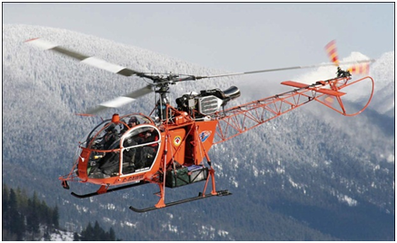 The SA315B "Lama" They can fly with ease to 24,000 ft. This SA315B Lama helicopter has 12 planetary gears, designed with utmost care to a perfect fit. Interesting how evolution could make 24 by accident's, each fit with tighter tolerances than this machine! Evolutionists claim to be open-minded and willing to modify their theory as new discoveries emerge. What will they do with the MO-1? The US peer review board has already declared MO-1 of evolutionary origin. As a pilot and technician that had his life depend on good equipment like the Lama, I would never let anything go to "chance". For more about my adventures in these and other aircraft in Alaska, see my book - "Last of the Long Hunters". Every machine like this comes with a set of manuals. People have a manual for life also. Its called the Bible. See the about section for more on that topic..
Motor formation in the growth cycle (1). We must consider the infant cycle of the development of this engine. As the DNA in the Prokaryote acts in the cell to form the motor in a step by step process, think about this...at some point in development the center shaft must breakaway and float to be able to rotate freely, correct? Why did this tiny single cell self-decide it needed to use this method? Why isn't this method of propulsion used in any other creatures of higher order? Did time do all this - billions of years? To the left is a lime disease cell Borrelia burgdorferi. The cited paper brought forth new information using Cryoelectron tomography vision technology. Now think about this for a moment - during the early growth and development (which may be measured in seconds) the protein structures would be directed by the DNA to form these cylinder shaped objects in the motors with very tight clearances. Then the fixed and rotary parts somehow breakaway to form the free spinning rotor shaft in the final assembly process! Modern AC motor showing rotor and stator assemblies - "Intelligence acting on Matter." The Axial Proton Motor arrangement is almost identical to modern AC (alternating current) brushless motors first invented by Nicolai Tesla (1) that changed the world. They said it couldn't be done! Think of it, a proton powered unit with no wires, bearings or metal, and 1/200,000 smaller than mans best device, (2) 'invented' long before Tesla made his! Amazingly, the Prokaryote motor can drive this little creature @ relative speeds of 50 BL (body lengths)/second and in the case of the MO-1, 100 B/L/Sec.! A Cheetah achieves a land speed of only 25BL/Sec. by comparison and that's in air, not fluid! 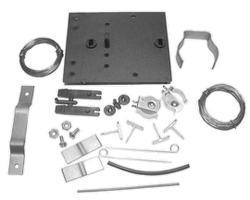 Purchase a battery powered motor kit ready to assemble. Read the instructions, wind the rotors, setup the whisker brushes, assemble the armature and commutator, add a battery and if completed correctly, the motor will spin. If so, Congratulations! you have applied intelligence to matter and created something that works with 3 or more parts - Intelligent Design proven. we're waiting, 1 Billion, 2 Billion. Getting rusty..
Now, disassemble all the parts and pile them on the table and wait. If they don’t self-assemble, congratulations, you have just falsified Evolutionary Theory. It claims with enough time, anything biological can occur, well, a motor is a motor, right? Do you think waiting a billion years will help? Now actually you cheated in this experiment because you selecting the correct parts (like Miller did), but still you falsified the theory anyway! And of course, this motor is far simpler that the proton powered unit in the bacteria! Like the impossibility of a complex software becoming better version by running over and over, so are the chances of DNA being run over and over and making a proton motor. The logic is the same. See The Question of Data - Genesis Alive! for more on the computer software analogy. 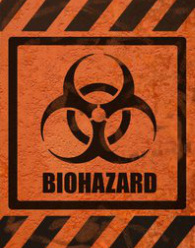 Let's do the same experiment with bio-chemicals So order the basic chemicals that makeup amino acids, mix them and wait…, the end result would be obvious, dead chemicals decaying in a flask! (Don't taste them, remember Miller got poisons!) In summary, one of the most marvelous technological wonders on earth, an axial proton powered motor, is found in the biological world! Only a Super-Intelligence acting on matter could create such a "marvel"! One must ask, how can evolutionary mindlessness self-create such advanced technology as disproved in these experiments? What would be the transitional forms and successions if mindless evolution was the only driving 'force' to make such a bio-device, and how many non-working intermediate 'mistakes' would it take to complete this complex working unit? Or, is the whole concept of evolutionary origins just wrong? Is it logical that mindless mutations would have form and function design goals that in logical experience are required? Don't working things with multiple parts require planning first to achieve an end result that works, applying intelligence to matter? Don't you think it would take a lot of faith to believe a proton motor or the MO-1 came from matter with no intelligence applied? Evolution asks you to have a such faith, but here's a better explanation; all life was placed on Earth together as we observe today! All the papers quoted in this post reflect only man observing living things. None of them has created anything that lives. "Flagella and motility represent two of the richest subjects in microbiology, involving not only bacterial genetics, molecular biology, and physiology but also bioenergetics, hydrodynamics, structural analysis, and macromolecular assembly. What is not well understood is the mechanism by which ionic energy is converted into mechanical work. Given the ubiquitous yet elusive character of the proton, this may not be too surprising." It's amazing that science and education institutions all over America will terminate any educator or professor who mentions or even suggests a Designer was involved in the origin of biological organisms. However, in the same moment if evolution is given credit, all is fine and their future secure. In this same context, evolutionary thinking is exhorted as the Father of Free and creative thought, but in truth it can be a dungeon of intolerance. Free thought is actually the Mother of Invention, and in order for science to progress, origins beliefs must be left at just that, an opinion about the past. If we can do so, our science and teaching institutions will flourish and attract greater thinkers, as people from all origins beliefs form dynamic free-thinking teams, moving our world closer to solving our larger issues. One example of a working free-thinking team was that of scientist Norman Borlaug, who determined how to multiply the wheat production of the world, saving untold millions of lives from starvation in the "Green Revolution". He was no cynic - he had positive solutions and acted them out! It should be noted that in his Nobel award speech he quoted the Bible 5 times. Do you think he had diversity on his team?, of course he did! Do you think he would agree with the intolerant environment that exists today, absolutely not! What can we accomplish with tolerance and understanding? Where has this new intolerance got us today? The old Soviet Union went down this same road and failed miserably, in a recent conference on origin's and America's problem of institutional stereotyping in Russia, an enlightened scientist correctly summed it up when he stated; "Oh, now I see, you're going where we're coming from!". Let's learn from their mistake's before it's too late. Thank you. B-2 Stealth Bomber on the left, 747 on the right..
B) Prokaryote bacteria (RH) to Eukayote cells (LH), (Eukaryotes are the cells that form multi-celled life, which include all animals and even people). Evolutionists must logically link the above single celled life forms in succession to explain how evolution accounts for all life on earth, right? This notion of upward complexity over time is refereed to as Common Ancestry, (like monkeys to man). Now we explained the impossibility of dead chemicals creating a working Prokaryote cell, which presents a huge barrier to the common decent concept. But what about these two types of cells, the Prokaryote and Eukaryotes, can we see common ancestry between them? The former with over 4 million DNA codons and a proton powered motor being "simple", the latter far more "complex" with 2.4 billion codon's and many, many more internal structures. Yes, Eukaryotes are very complex, but both are complex in their own right. Does that prove one evolved from the other? Or, are they each independent and radically different life forms, designed to accomplish their individual purpose's? Further, where are the intermediates and the mechanism to add this complex data if they evolved? The evolutionists answer, a Prokaryote swallowed another and became a Eukaryote. Symbiotic relationships exist in nature for sure, but evolution by consumption is another matter entirely! A question; How can these two enjoy complete stasis yet form the basis of all evolutionary progression? Binary Fission maintians DNA structure, Motosis uses condensation. A natural place to start is the multiplication process of each type of these two cells. Looking at the two, one can see a load of differences. Prokaryote's employ a process known as "Binary Fission" to multiply (LH image). This is where the DNA (in loops) and other structures are imaged into two identical sets, each pulling back to the opposite extremities of the cell in the division process. Soon after, the cell forms a squeeze point in the middle, (conveniently opposite the end with the flagella motor!) and then pull into two identical units, the new "sister" now forming into adulthood. The proton motor is assembling in the new half, the sequence only taking minutes! We hope after considering the information given you are encouraged to consider the possibility of a Creator. Even though evolutionary thought prevails our society, the other side of the Origin story clearly points to Intelligence, an Intelligence you may know through Jesus Christ, the Author of all life. God sees you reading these lines now and desires you to have a fuller knowledge of Him and His provision made in your behalf. God enjoys your marveling and searching out His works, He further enjoys you understanding Him! God Bless you with His truth!